The employees at Ems Ports Agency & Stevedoring (EPAS) Beteiligungs GmbH & Co. KG (EPAS) in Emden, Germany have many years of experience in working with mobile harbor cranes. 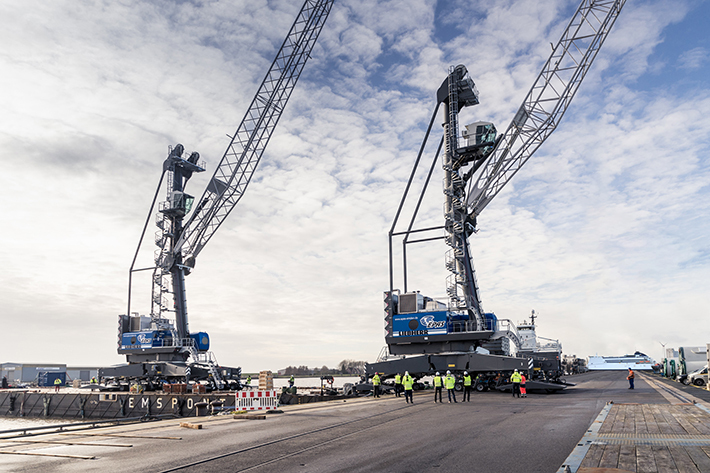 To further increase the turnover capacity, the German port company invested in high-end mobile harbor crane technology from Liebherr. Early in 2018 EPAS received two new Liebherr machines, type LHM 420, from the Liebherr maritime headquarter in Rostock, Germany. Each crane has a maximum lifting capacity of 124 tonnes at an outreach of up to 18 meters. This valuable investment will significantly improve the logistic processes at the Nordkai terminal in Emden. The main driver in the decision process was the capability to do twin lift operation. Liebherr convinced with its synchronized lifting assist system Sycratronic. The system allows the operation of two Liebherr cranes in tandem mode. A crane operator controls the movement of both machines that are electronically synchronized. While manual tandem lifts have to be restricted to 75% of the crane’s capacity, Sycratronic guarantees 100% utilization of the maximum load capacity. In tandem lift operation (EPAS) can now lift up goods weighing up to 248 tonnes. Greater productivity is also achieved through the ability to handle multiple ships simultaneously. “The purchase of the two very powerful new Liebherr cranes is the prelude to a series of investments we are planning to provide our customers with the best possible service and competitive positioning in the future,” says Heinrich Smidt, Managing Director of Ems Ports Agency & Stevedoring (EPAS).